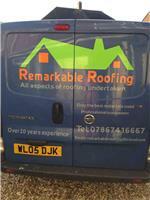 Remarkable Roofing - Roofer based in Bournemouth, Dorset. We have been roofing for 20 years and have great experience in the industry. We only use the very best top quality materials to guarantee the best possible job. Remarkable Roofing believe we will beat any genuine like for like quote.